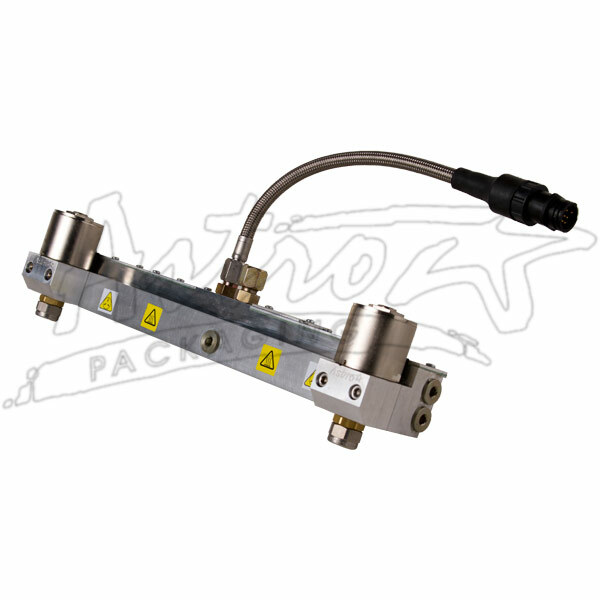 Astro Packaging M100/EM100 applicators are high speed, all‐electric, single and multiple valve applicators designed for precise pattern placement of adhesive material. M100/EM100 applicators include one to eight electric dispensing modules(valves), each with a spring loaded armature inside the adhesive chamber. Each module, positioned on an applicator manifold and secured by two screws, deposits an adhesive bead precisely and independently. The manifold supplies all modules from a single hose. The hose electrical connector supplies electrical power. The module design allows for field servicing of all elements, and the modules use standard Viton O‐rings for seals. M100 applicators mate with the Slautterback 100 ohm RTD systems and use a 9‐pin or 16‐pin cordset.